In this week’s reading from Parashat Toldot (Shemot / Genesis 25:19-28:9) we read about the struggle between Jacob and Esau within Rebecca’s womb (25:21-23). We learn that Esau became a skilled hunter and Jacob dwelled in tents (25:27-28). According to the narrative, Esau despised his birthright. This is taken from the text that states he sold his birthright for a bowl of soup (25:29-34). The Torah portion continues to describe Isaac’s interaction with Abimelech (26:26-31). According to the Scriptures, Jacob stole the birthright with a bowl of soup, he also stole the blessing from Isaac (27:1-41). The portion concludes with Jacob fleeing to Haran (27:42-28:9) out of fear for his life from his brother. This week’s reading contains a number of significant events in the life of both Jacob and Esau that are referenced throughout the history of Israel and all of Scripture. The Scriptures tell us that both Jacob and Esau struggled within Rebecca and she inquired of the Lord and He said, 25:23 …‘Two nations are in your womb; And two peoples will be separated from your body; And one people shall be stronger than the other; And the older shall serve the younger.’ (NASB) According to the Scriptures, it becomes apparent that this struggle is related to the one who walks by faith and the other who despises God’s ways. Thinking on the topic of the one who walks by faith verses the one who despises God’s ways, reading through the opening verses to the Parashah, an interesting midrash may be derived using the rabbinic style on interpreting the differences between Jacob and Esau according to Bereshit / Genesis 25:27, כז וַיִּגְדְּלוּ הַנְּעָרִים וַיְהִי עֵשָֹו אִישׁ יֹדֵעַ צַיִד אִישׁ שָֹדֶה וְיַעֲקֹב אִישׁ תָּם ישֵׁב אֹהָלִים: 25:27 When the boys grew up, Esau became a skillful hunter, a man of the field, but Jacob was a peaceful man, living in tents. (NASB) In the opening verses, we are told something about these two boys, Jacob and Esau. The Scriptures say that Esau loved to hunt, that he was a skilled hunter and a man of the field. On the other hand, Jacob was a peaceful man who lived in tents. Immediately, there is an interesting contrast being made, suggesting that one who hunts is not a peaceful man. On the other hand, the one who dwells in tents is full of peace. The concept being established here might be that the one who likes to go out into the field likes to be alone. Whereas, the one who dwells in tents must be capable of dwelling with others being a peace maker as compared to the type of person who prefers to be alone. While reading through the Hebrew text, I noticed something quite interesting, it is possible to interpret Bereshit / Genesis 25:27 in a way that is very midrashic. This week, let’s try to understand this verse (Bereshit / Genesis 25:27) from a midrashic sense by breaking down this verse into two sections as shown below. וְיַעֲקֹב אִישׁ תָּם ישֵׁב אֹהָלִים, Jacob was a peaceful man, living in tents. 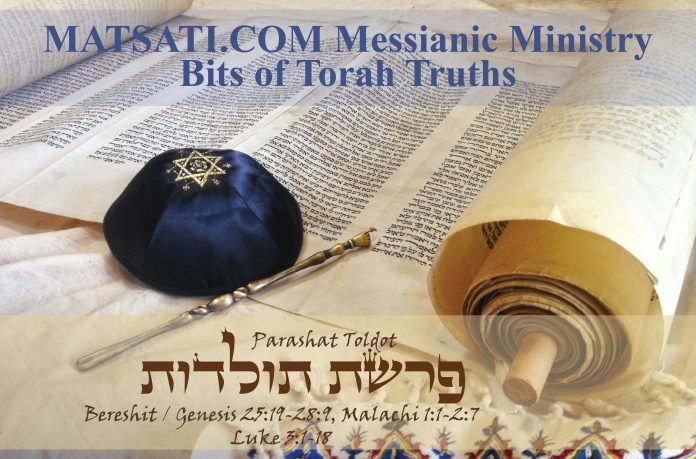 In the midrashim, the rabbis use various methods of exegesis for interpreting the Scriptures. The following seven examples are taken from the seven middot attributed to R. Hillel and cataloged in Tos. Sanhedrin 7.11 (see http://jewishencyclopedia.com/articles/10801-middot-the-seven-of-hillel). Gezerah shavah (equal decision or determination) – argument from analogy. The two texts are linked together on the grounds of verbal similarity; the two texts are then used to illustrate and amplify one another. According to the later rules the argumentation must be founded on texts from the Torah, and the hinge-word be the same. Obviously this principle can be used and abused very widely, so that the limitation mentioned above, that its use must be authorised by tradition, seems wise. Example: In one passage on divorce, Devarim / Deuteronomy 24.1, the command implies a written document, so also it must imply a written document in the case of the command on the manumission of slaves in Shemot / Exodus 21.27 (Mek. on Ex 21.27). Binyan ab mi-katub ehad – (a construction of a ‘father’, from one text and the application to others), i.e. one scriptural passage forming the basis for interpretation of others. Binyan ab mi-shnei ketubim -This is the same as the preceding. The interpretation is stronger because the principle is drawn from two texts. For example, from Mekhilta de R. Ishmael (neziqin 9): Using Shemot / Exodus 21.26 and 27, which prescribe that a master must let his slave go free if he damages the slave’s tooth or eye, it is argued that a major and irreplaceable organ is envisaged; a class is constituted from the two examples. A master must therefore release a slave if he has damaged any of his major, visible and irreplaceable organs. Kelal u-perat, u-perat u-kelal (general and specific and specific and general) – what applies to the general applies also to the specific. This may be used in two directions. Either the narrower term is understood to restrict the wider, so that Vayikra / Leviticus 1.2 excludes wild beasts, or the wider term generalizes the narrower, as in Shemot / Exodus 22.9. Each of these is familiar from Roman Law. For example, uses Vayikra / Leviticus 1.2 ‘You shall bring an offering from the cattle [general], from the herd or the flock [specific]’ in Sifra, intro 7. Keyotze’ bo be-maqom aher – is interpretation of one passage by another similar passage in scripture. For example, in Baba Kamma 86b, interpreting the ‘killer’ of Bamidbar / Numbers 35.31 by means of the ‘killer’ of Devarim / Deuteronomy 19.3, and ‘guilty’ in Devarim / Deuteronomy 25.2 by means of ‘guilty’ in Bamidbar / Numbers 35.31. Dabar ha-lamed me-inyano (a word that learns from its context) – For example, in Sanhedrin 86a the prohibition of stealing (Ex 20.15) is interpreted as a prohibition against stealing human beings because the general context is one which involves capital punishment. Notice how the word שָֹדֶה (field) becomes ַשֵּׁד (demon) and אֹהָלִים (tents) becomes אֱלֹהִים (God). (A Torah example of the word for demons (plural form) is found in Devarim / Deuteronomy 32:18 (לַשֵּׁדִים) 32:17 ‘They sacrificed to demons who were not God, To gods whom they have not known, New gods who came lately, Whom your fathers did not dread. NASB) If we take this approach, exchanging the letters in this way, we find that Esau was a man of demons, and Jacob, dwelled with God. Reading through Midrash Rabbah on this week’s Torah portion, the rabbis do not draw conclusions on Jacob and Esau in this particular method of exegesis. However, studying both the Bible and the rabbinic literature, we find that the same conclusion is drawn regarding Esau being a man who loved idols which correspond to demons, and Jacob a man who loved God. These are the generations of Izhak bar Abraham. And because the appearance of Izhak resembled the appearance of Abraham, the sons of men said, In truth Abraham begat Izhak. And Izhak was the son of forty years when he took Rivekah, the daughter of Bethuel the Aramite, who was of Padan Aram, the sister of Laban the Aramite, unto him for a wife. And Izhak went to the mountain of worship, the place where his father had bound him. And Izhak in his prayer turned the attention of the Holy One, blessed be He! from that which He had decreed concerning him who had been childless. And he was enlarged, and Rivekah his wife was with child. And the children pressed in her womb as men doing battle. And she said, If this is the anguish of a mother, what then are children to me? And she went into the school of Shem Rabba to supplicate mercy before the Lord. [JERUSALEM. And the children pressed in her womb, and she said, If such be the anguish of a mother, what now is life, that children are to be mine? And she went to supplicate mercy before the Lord in the beth midrash of Shem Rabba.] And the Lord said to her, Two peoples are in thy womb, and two kingdoms from thy womb shall be separated; and one kingdom shall be stronger than the other, and the elder shall serve the younger, if the children of the younger will keep the commandments of the Law. And the two hundred and seventy days of her being with child were completed to bring forth; and, behold, twins were in her womb. And the first came forth wholly red, as a garment of hair: and they called his name Esau, because he was born altogether complete, with the hair of the head, and the beard, and teeth, and grinders. [JERUSALEM. And the first came forth wholly red, as a garment of hair: and they called his name Esau.] Afterward came forth his brother, and his hand had hold on the heel of Esau. And they called his name Jakob (Jacob). And Izhak was a son of sixty years when he beget them. And the lads grew; and Esau was a man of idleness to catch birds and beasts, a man going forth into the field to kill lives, as Nimrod had killed, and Hanok his son. But Jakob was a man peaceful in his words, a minister of the instruction-house of Eber, seeking instruction before the Lord. And Izhak loved Esau, for words of deceit were in his mouth; but Rivekah loved Jakob. Notice how the Aramaic Targum describes Esau as going into the field to “kill lives,” and parallels him to Nimrod who was known as a mighty hunter, and also a man who worked great iniquity through idol worship (dealing with demons). Jacob on the other hand is paralleled to being a man of peace, dwelling with God, and seeking instruction (just like Abraham). In addition to this, Midrash Rabbah Bereshit, Parashat 63, Part 6 (מדרש רבה בראשית פרשה סג סימן ו) has the following to say regarding Jacob and Esau. And the Children struggled together (Wayyithrozazu) within her (Bereshit / Genesis 25:22). Rabbi Johanan and Resh Lakish discussed this. Rabbi Johanan said, Each ran to slay the other, Resh Lakish said, Each annulled (mattir) the laws (Ziwwuyaw) of the other. Rabbi Berekiah observed in Rabbi Levi’s name, Do not think that only after issuing into the light of the world was he (Esau) antagonistic to him, but even while still in his mother’s womb his fist was stretched out against him, thus it is written, The wicked stretch out their fists (zoru) from the womb (Tehillim / Psalms 58:4). And the Children struggled together within her. They sought to run within her. When she stood near synagogues or schools, Jacob struggled to come out; hence it is written, before I formed you in the belly I knew you (Jeremiah 1:5). While when she passed idolatrous temples, Esau eagerly struggled to come out; hence it is written, The wicked are estranged from the womb (Tehillim / Psalms 58:4). According to Midrash Rabbah Bereshit, Parashat 63, Part 6, the rabbis say that in the womb, each man run to slay the other, how each annulled the laws of the other, and the children struggled together in the womb. The interpretation is that Esau struggled to come out of idolatrous temples, and Jacob struggled to come out of synagogues and schools. Based upon the Gezerah shavah interpretation of the Scriptures, it is interesting to study the similarity between the interpretation from the rabbis that appears to be very consistent with the historical account of Esau and his descendents (Edom). In the parashah text on Bereshit / Genesis 25:30 it says about Esau, עַל-כֵּן קָרָא-שְׁמוֹ אֱדוֹם “his name will be called Edom,” a nation of people who became known as those who do not live by faith (Ezekiel 24:12-14). In Romans 9:10-13, the Apostle Paul wrote of Jacob and Esau, one who walked in faith and the other who walked in sin. The Lord God chooses Jacob to be the father of His chosen people because he was a man of faith. The Lord rejected Esau because he did not care about the covenant promises indicated by selling his birthright and taking from the daughters of the land of Canaan (Bereshit / Genesis 26:34). Jacob on the other hand regarded the covenant of Abraham and worked to obtain the covenant and blessing of the Lord. Parashat Mishpatim, Selling ourselves into slavery by the work of sin.